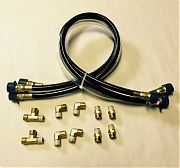 The SI-TEX Hydraulic Autopilot Installation kit includes everything you need to install an Autopilot Hydraulic Pump into a Hydraulic Steering System. The Kit includes (3) 30? high quality Hydraulic Hoses with compression fittings on each end. The Hoses are rated for 1000psi and are designed to be soft and pliable which helps to eliminate pump noise. The Clear hose is intended for the low pressure reservoir connection and allows the installer to easily see if there is any air in the Hyd. System. The Kit includes all the ¼? NPT fittings needed to tee in the pump to a steering system. This kit saves installers a tremendous amount of time and eliminates the need to search all over town looking for the fittings needed to install an Autopilot pump.